We're on the road before noon. The weather is perfect for riding. The bike feels super heavy, I've never ridden anything that feels this big. The county road we exit on is bumpy and dippy and is a good example of what we should be able to handle. The bike is bottoming out and I have to take it real slow. I just say to myself "Slow is good, this is OK" (holy crap). Our first thought is ride through Minneapolis and do the Joint bar scene where the slogan is "Where the ride begins and ends" It would have been cool but we've 'been there, done that'. Heidi wants to do something new (liken' that) We shoot for North Dakota, neither of us have ever been there before. Our goal is to do VFF (Very Few Freeways) but that calls for a lot of map reading and looking at the sky, the type of travel I like and am use to but it kind of freaks Heidi out. Ya know, getting lost and all that. I stiffen the rear shocks all the way at a gas stop. I thought I had them midway but they are only slightly stiffer then the lightest setting. I don't mention it to Heidi but she notices the riding difference right away. (I like that A Lot…..) The bike feels a lot better now. We still dip down low but we don't bottom out. This is good to say the least. 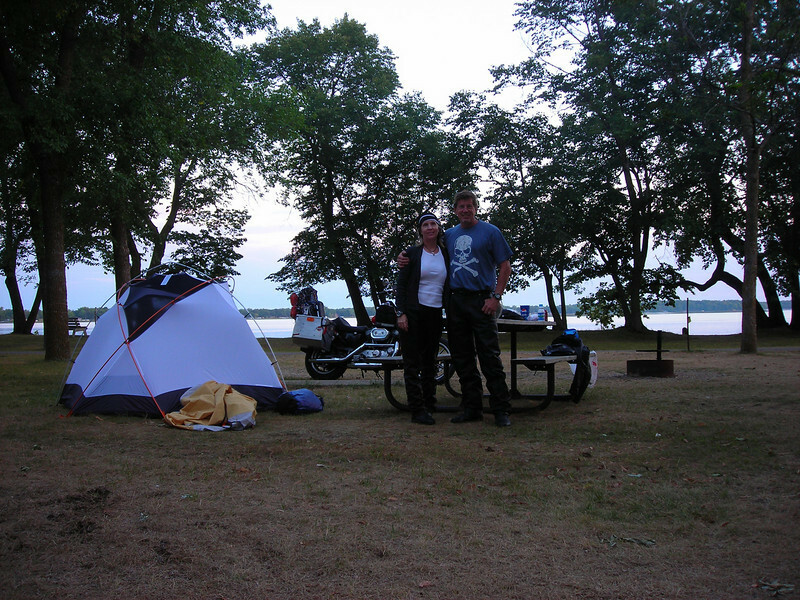 Heidi and I try to get into the motorcycle travel philosophy right away. We don't want to push too hard the first day and not like it, so I constantly look for places to chill in a nice country scene. I prefer this to a gas station or restaurant. The first stop is a golden farm field with plenty of crickets. Heidi thinks it was weird but she did enjoy the rest in peace. I do a better job finding the nest rest place. Heidi is into it, she knows just what to do. We throw out our leathers on the grass in the shade. A bottle of water, 'This Is Good'. We do not make it to Fargo the first day but do find a great state park (Carlos State Park) on a small lake just north of Alexandria, Minnesota. The place has a nice swimming beach right in front of our tent. This is a popular spot and has campers all around. As always Heidi and I engage in some intense and slightly heated discussions. I say "Stop yelling at me" and bring up that other campers are probably hearing us and thinking we're fighting. Heidi says "I'll stop yelling at you when you stop doing stupid stuff!" We laugh. We are really hammering out our system (I hope).